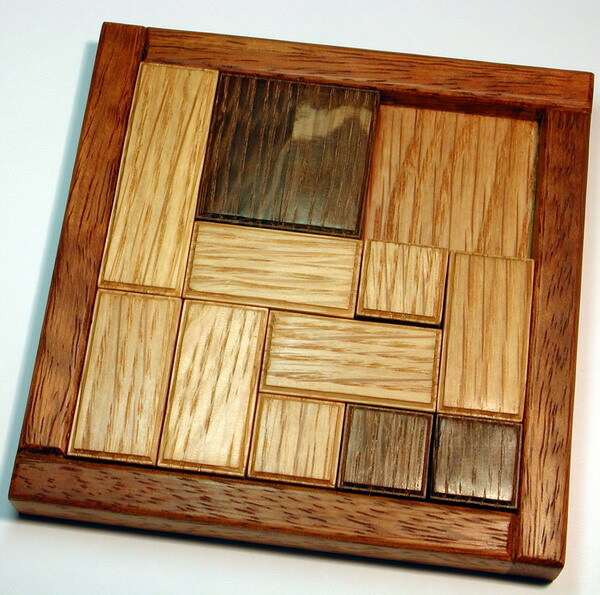 The "meet me at the corner puzzle", is the second sliding block i designed . It has 9 pieces of which one, is a big dark square and has to go straight to the bottom. The two small dark squares have to go all the way to the left,one on top of the other, hence the name "meet me at the corner".Rearrangements can be done, but the original design is the one i enjoy and "brainblock most". The game i think has more than 45 moves to bring it to final state. See more pics of the meet me at the corner puzzle.or Back to puzzle index.